The media committee of the Freedom and Dignity Strike said on Monday that a serious deterioration has occurred to the health condition of MP Marwan al-Barghouthi who has been on hunger strike along with 1,500 prisoners for the 8th day in a row. The committee, which was created by the Palestinian Committee of Prisoners and Ex-Prisoners Affairs and the Palestinian Prisoner Society, said in a statement that Barghouthi refused to take the medicine offered to him by the al-Jalama prison warden. The al-Jalama warden asked the hunger-striking prisoner Nasser Abu Hmeid to convince Barghouthi to take the medicine, but Abu Hmeid refused saying, "If Marwan al-Barghouthi dies, he will die a martyr," according to the committee. The Israel Prison Service (IPS) punished Abu Hmeid by transferring him to Eshel prison. The IPS continues to prevent lawyers from visiting the striking prisoners since the start of the hunger strike, making it very difficult to obtain information about the conditions in the prisons. 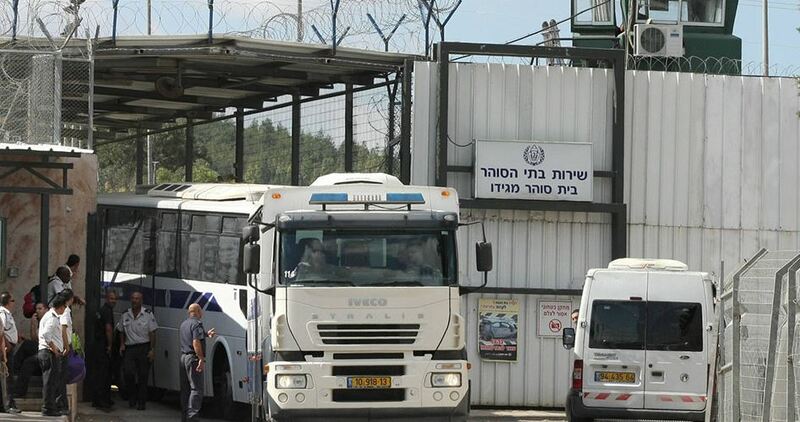 Israeli Prisons Service (IPS) closed Hadarim Israeli jail and transferred Palestinian captives held there to Negev desert prison, the media committee of the hunger strike follow up announced on Monday. 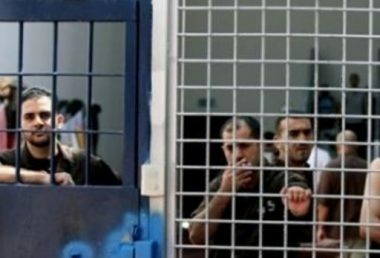 The committee said, in a statement, that 100 out of 120 detainees in Hadarim jail joined the open hunger strike since the first day. They were transferred to isolation sections in other prisons. The 20 remaining captives who did not join the hunger strike because of illness were moved on Monday to Negev prison. The transfer of the sick detainees aimed at penalizing the striking prisoners as well as the ill captives by repeated transfers, the statement added. Some 1,500 Palestinian captives held in Israeli jails have been on an open hunger strike for the eighth consecutive day in order to demand their human rights. 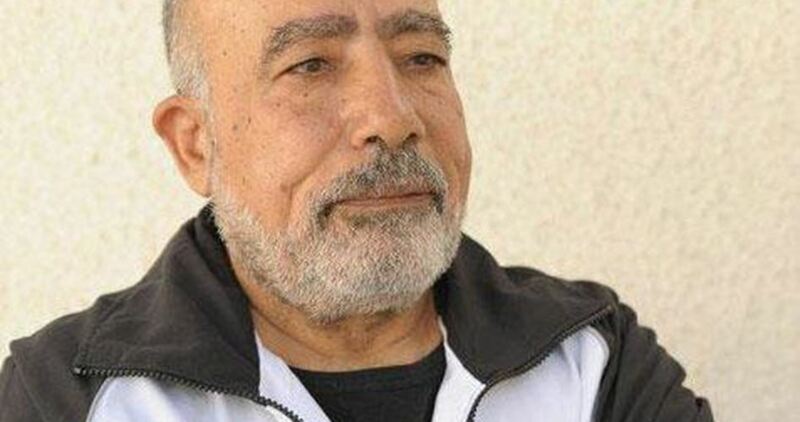 Deputy chairman of Hamas political bureau, Ismail Haneyya, called Monday for mobilizing support for the Palestinian detainee Fouad al-Shoubaki, held in Israeli jails. Haneyya’s solidarity was expressed a few days after the national campaign to push for the release of al-Shoubaki appealed to the International Red Cross, among other concerned bodies, to urgently work on releasing the elderly detainee. The campaign’s coordinator, Abed al-Mutalib al-Nakhal, said prisoner al-Shoubaki, aged nearly 80 years old, has been diagnosed with life-threatening diseases, most notably prostate cancer, renal insufficiency, abdominal muscle weakness, and sight disorders. Haneyya called on all concerned institutions to immediately step in and push for the release of al-Shoubaki before it is too late. Haneyya expressed his support for the protest moves initiated by the Palestinians in Israeli lock-ups, vowing that the prisoners’ cause will forever top Hamas’s resistance agenda. 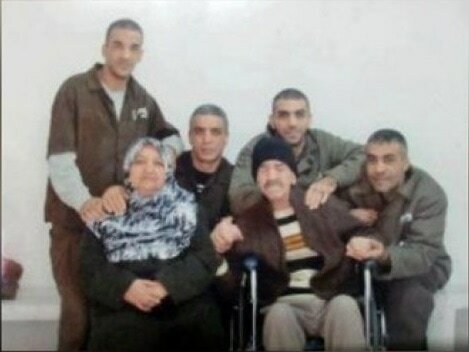 In 2002, prisoner al-Shoubaki was sentenced to four years in the Palestinian Authority (PA) Jericho jail, under British and American supervision. Al-Shoubaki, who served as former chief of financial affairs at the General Security Service and President Yasser Arafat’s financial adviser, was sent to Israeli prisons after the Israeli occupation forces kidnapped him from Jericho jail on March 14, 2006, in collaboration with the PA security apparatuses. 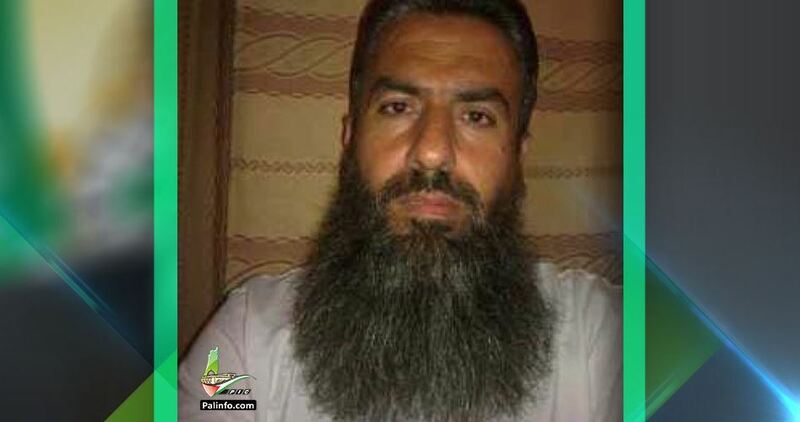 The Israeli Occupation Authorities (IOA) renewed the administrative detention of Sheikh Bajes Nakhla, who is currently held in solitary confinement, for three months. Sheikh Nakhla, from Jalazoun refugee camp to the north of Ramallah, spent more than 18 years in Israeli jails, mostly in administrative detention. In 1992, he was deported to Marj Al-Zuhour in Southern Lebanon for a whole year. His house was recently notified with demolition, his wife affirmed. A mass hunger strike for Palestinian prisoners in Israeli jails has entered its eighth consecutive day on Monday. 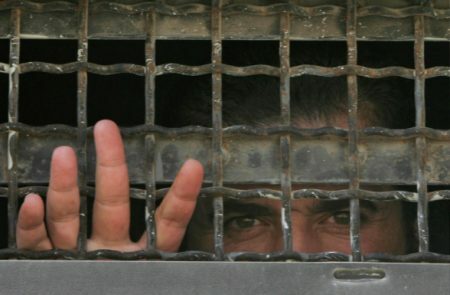 Some 1,580 Palestinian detainees, up from 1,500 on Saturday, have joined the mass hunger strike staged in Israeli jails to protest their dire conditions of captivity and to press for basic rights, including family visits, health care, lawyer visits, better quality of food, and humanitarian treatment in addition to an end to the policy of administrative detention and solitary confinement. A series of rallies, marches, and protest moves has been ongoing across the occupied Palestinian territories and overseas in solidarity with the Palestinian hunger strikers. Dozens of Israeli soldiers invaded, on Monday at dawn, the towns of Beit Ummar and Yatta, in the southern West Bank governorate of Hebron, searched and ransacked many homes, and abducted two young men. Mohammad Awad, a media activist with the Popular Committee in Hebron, said the soldiers invaded Beit Ummar town, northwest of Hebron, before breaking into homes and violently searching them. He added that the soldiers abducted a high-school student, identified as Ahmad Adel Za’aqeeq, 18, and took him to Etzion military base and security center, north of Hebron. Clashes took place between the soldiers and many local youngsters, especially near the Old Mosque, and the soldiers fired many live rounds and concussion grenades. In addition, Rateb Jabour, the coordinator of the National and Popular Committee in southern Hebron, said the soldiers invaded Yatta town, south of Hebron, searched and ransacked homes belonging to Mohammad Ahmad Abu Arram, Mahmoud Ayed Abu Arram and Sami Issa al-Adra. 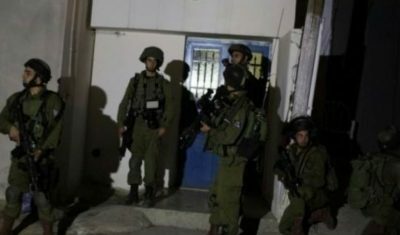 Israeli soldiers invaded, on Monday at dawn, several villages and towns, in the northern West bank governorate of Jenin, searched many homes, and abducted two young men. The Jenin office of the Palestinian Prisoners’ Society (PPS) said the soldiers invaded and ransacked many homes in Maraka village, and abducted a teacher, identified as Talal Mustafa Abu Jalboush, 30, in addition to Mo’taz Yousef Abu Jalboush, 24. Furthermore, many army vehicles invaded Sanour, Zababda and Msalya towns, conducted extensive and violent searches of homes, and interrogated many Palestinians while inspecting their ID cards. 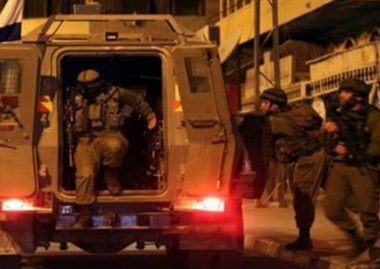 Israeli soldiers abducted, on Monday at dawn, two young Palestinian men, from their homes, in Sawahra and Abu Dis towns, in Jerusalem governorate, in the occupied West Bank. 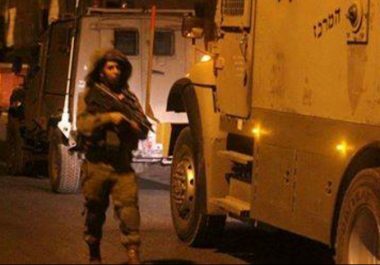 Several military jeeps invaded the two towns from different directions, stormed and violently searched homes, and abducted Morad Ayyad, from Abu Dis, and Hakem al-A’raj, from Sawahra, southeast of Jerusalem. The two Palestinians were cuffed and blindfolded, before the soldiers took them to an unknown destination. 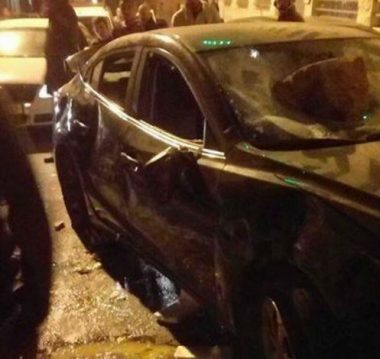 Palestinian medical sources have reported that two children were injured, on Sunday evening, after being struck by a speeding Israeli settler’s car, while walking with their parents in Sur Baher town, south of occupied East Jerusalem. The sources stated that Mohammad Mousa Attoun suffered a head wound, while his sister, Nada, suffered several cuts and bruises. 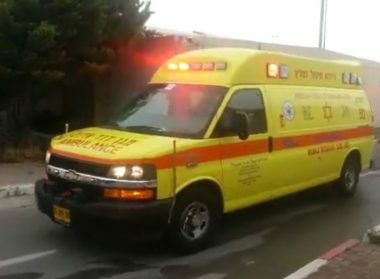 An Israeli ambulance was called to the scene, and moved the two children to a hospital for treatment; their condition has been described as stable. Eyewitnesses said a settler, who was accompanied by a passenger, entered the center of town from its main road, and was speeding through its streets, apparently while being chased by an Israeli police car, before ramming the two children in addition to striking several parked cars. The settlers fled the scene, and hid in a medical center, before dozens of soldiers invaded Sur Baher, clashed with many local youths, and evacuated them. In Ramallah, several military jeeps and trucks invaded Bani Saleh village, northwest of the city, and searched many homes before abducting two children, identified as Ahmad Tamimi, 15, and Mohammad Tamimi, 14, and took them to an unknown destination. The joint media committee of the Palestinian Prisoners’ Society and the Palestinian Detainees’ Committee, has reported in a press release, Sunday, that the Israeli Prison Authority is still denying all lawyers’ visitations with the hunger striking detainees, except for those held in Ofer prison. The committee stated that this illegal ban is now facing ongoing legal efforts, including various appeals, while human rights groups, including organizations defending the detainees’ rights, are preparing to file an appeal with the Israeli High Court. It also stated that the lawyers, who requested to meet with hunger striking detainees in different prisons, have faced repeated denials, under various allegations, including, the claims that certain detainees have been transferred to other prisons, and in some cases, the lawyers were allowed to visit with detainees who have not joined the hunger strike yet. The committee added that the administrations in Asqalan, Majeddo and Ramla prisons, have denied all visitations with the hunger striking detainees, while Eshil and Nafha claimed they are still deciding on the issue. Former Palestinian detainee Mahmoud Balboul spoke out, on Sunday, about his experience undertaking a weeks-long hunger strike, last year, and urged Palestinians everywhere to stand in solidarity with a mass hunger strike currently underway in Israeli prisons. 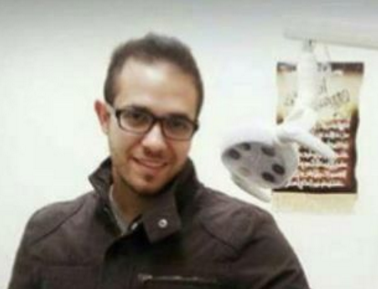 Mahmoud Balboul refused food for 79 days, after launching a hunger strike last July, and was joined by his brother Muhammad two days later, who refused food for a total of 77 days. They both suspended their strikes after reaching a deal with Israel, stipulating their release from administrative detention — internment without charges or trial, a practice that has become a main target of the ongoing mass hunger strike. According to Ma;an News Agency, the Balboul brothers attended a sit-in tent in their hometown of Bethlehem, in the southern occupied West Bank, on Sunday, among a number of similar tents set up across the occupied Palestinian territory in solidarity with approximately 1,500 imprisoned hunger strikers. 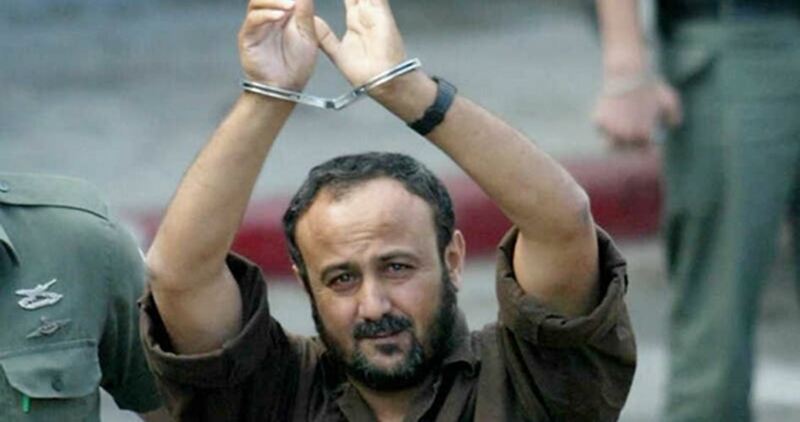 “It is of the utmost importance for the people to stand with the families of Palestinian prisoners first, and the hunger strikers themselves second, because a hunger-striking prisoner has prepared himself politically and psychologically for the experience — he has already gone through so many difficulties that have enabled him to adapt to any situation, despite all obstacles,” Balboul continued. Speaking of his own experience, Balboul stressed that his brother Muhammad’s participation emboldened him to continue in the hunger strike against all odds. “A hunger striker needs support and solidarity to be able to continue,” he said. He said that there were only two occasions upon which he felt defeated by the weight of his emotions. First, when an International Committee of the Red Cross (ICRC) employee delivered him a letter from his mother that told him to stay determined; and second, when he was put in a solitary confinement cell under exceptionally miserable conditions. Balboul directed a message to all Palestinian prisoners on hunger strike, telling them to stay strong and not listen to Israeli authorities’ lies and rumors, which he said were only circulated to break the will of the hunger strikers. “Just focus on achieving your goal and stay calm. Think of freedom, and you will stay determined. When you are determined, you will reach victory,” he said. At least 40 Palestinians being held in the Israeli prison of Megiddo have joined the open-ended mass hunger strike, said the strikers’ Media Committee of “Freedom and Dignity”. The committee said, according to WAFA, that the prison administration prevented the lawyer from visiting the hunger strikers. The mass strike entered its seventh day on Sunday. 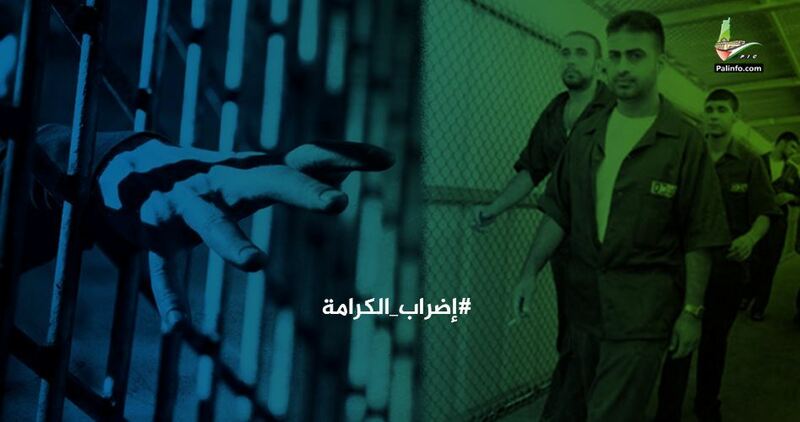 The detainees aim to restore many of the rights that were taken from the, by the prison administration, which they had achieved through many past strikes. They are demanding to be moved to prisons in the occupied territories as per the Fourth Geneva Convention, which would make it easier for their families to visit them, as well as lifting restrictions on family visits and better treatment at military checkpoints, along with other demands.